From Santa-shaped stocking stuffers to foil-wrapped Hanukkah gelt, chocolate is a deliciously classic holiday gift. But today’s chocolate-bar wrappers do a lot more than cradle a bar of the sweet stuff. They flaunt specialty ingredients, tout health benefits, vow to save the planet, and share stories about the farmers who grew the beans. With so much information vying for limited wrapper real estate, finding the perfect chocolate to bestow upon loved ones is no longer as simple as reaching for the nearest Hershey bar. Below, we’ve demystified eight common-but-confusing chocolate terms to help you find the right sweet for everyone on your list, or simply ace your next trip to the candy aisle. “Less cacao generally equals more sugar \[in a bar\],” says Anne Deblois, author of the new cookbook My Chocolate Bars. This explains why Hershey's supersweet milk-chocolate bar contains around 11 percent cacao, while most bars that advertise their cacao content hover in the 50 to 70 percent range. Some daredevil bars inch into the low 90s. #(clear n2). Antioxidants. In 1998, a Harvard medical study tentatively linked the antioxidants found in chocolate (called flavanols) to cardiovascular health and longer life. Chocolate lovers rejoiced and, over the following decade, have made “chocolate is good for you” their celebratory mantra. Unfortunately, flavanols also contribute to chocolate’s bitter taste, which means some confectioners remove them from their final product. While many brands — particularly high-quality dark chocolates — are still likely contain flavanols, looking for a special “antioxidant” seal is one way to be certain that the bar in your basket will be as good for your heart as for your taste buds. #(clear n3). Single origin. The concept of a single-origin product — already common to the worlds of wine and olive oil — has only recently made its way to chocolate. It indicates that the cocoa beans used to make a bar were all grown in the same geographic region. Some culinary experts believe that the terroir where a bean is grown — the climate, soil properties, and farming techniques used to produce it — impacts its taste. A bar from Costa Rica, for example, might be “nutty” and “savory,” while one from Ghana might taste more “floral.” Blending beans from different locations, these experts say, muddles a bar’s potential for achieving subtle, unique flavor. #(clear n4). Organic. Like all certified-organic products in America, chocolate bars must contain at least 95 percent organically produced ingredients to bear the USDA organic seal. Some sustainable-agriculture enthusiasts claim that organic standards have been watered down since J.I. Rodale first began publishing his seminal magazine, Organic Gardening, in 1942. Regardless, the popularity of organic chocolate has helped shift growing practices around the world. “When we first started making chocolate, the only place you could get organic sugar was the island of Mauritius — this tiny dot in the Indian Ocean,” says Peter Meehan, who co-founded Newman’s Own Organics with Paul and Nell Newman. Today, sugar farmers from South America to Florida now farm organically. #(clear n5). Artisanal. The word “artisanal” gets thrown around rather liberally in the gourmet-food world, but at heart, it refers to products crafted with the great skill and care of a seasoned expert. Deblois’ cookbook, which describes the fundamentals of homemade chocolate production and includes tantalizing recipes for dark chocolate with lemon curd, wasabi, cardamom, and fleur de sel, among others, is perhaps the best gift for aspiring chocolate makers. 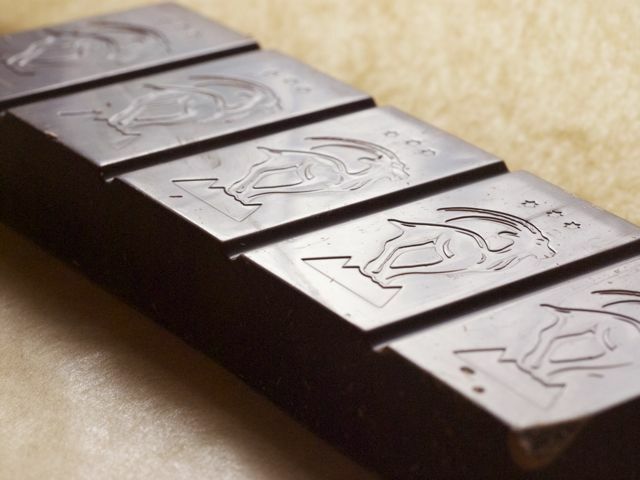 If you prefer to give a pre-made bar, choose one that is handcrafted and produced in small batches. #(clear n6). Fair trade. The fair-trade seal is most commonly found on coffee, but has spread to many other products, including chocolate. According to the nonprofit third-party certifier TransFair USA, fair-trade practices ensure that cacao farmers (who typically live in developing countries in South America, Africa, and Southeast Asia) receive a guaranteed minimum price for their products, enjoy safe working conditions, and employ sustainable growing methods that benefit their own health as well as the planet. #(clear n7). Cane sugar/juice. The outcry against two of America’s most ubiquitous ingredients — refined sugar and corn syrup — led by nutrition experts like Marion Nestle and watershed books like The Omnivore's Dilemma has helped accelerate the popularity of more “natural” sweeteners. Many gourmet chocolate companies use raw cane sugar or evaporated cane juice, which are both derived from sugar cane but are not as processed as (and therefore contain more nutrients than) refined sugar or corn syrup. Cane-sweetened chocolate bars are less intensely “sweet” than conventional bars and allow the cocoa flavor to shine through. #(clear n8). Vegan. Finding vegan chocolate bars is a bit more complicated than simply avoiding milk chocolate. Even some dark-chocolate brands include small amounts of dairy, or were processed on machinery that also processes milk products — a practice that renders them unacceptable for strict vegans. While a handful of companies have begun to label their chocolates as “vegan-friendly,” the most reliable way to find out if a bar is animal-free is to check the ingredients. Avoid bars that contain casein, whey, or other milk derivatives. And remember that, despite its name, cocoa butter is an edible vegetable fat that comes from the cocoa bean and contains no dairy. p(bio). Leah Koenig is a freelance writer based in Brooklyn.